I didn't really mean for my blog to turn into The Landon Chronicles, but since the little guy is my constant companion I don't really have much else to share. Landon hangs with me while getting ready in the morning. As you can see in the picture the little lover boy gave me some arm hickies. We also watered the backyard together. And then headed to Laura's Grandmother's beach house for some rays. 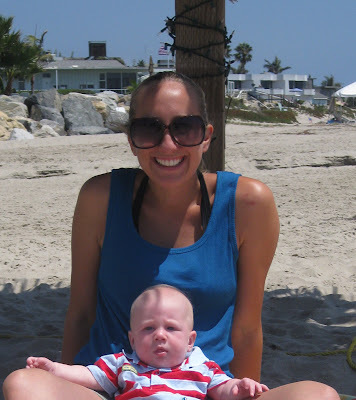 Although he had been to the beach many times before this was Landon's first experience with toes in the sand. He thought it was so fun and kicked his little feet around until the sand started to chaff his sensitive skin. After a nice long beach nap we headed home and straight for the bath. Landon was covered in sand (and an explosive baby boy poo.) This was his first sink bath and he loved splashing around and creating a huge mess in the bathroom. Finally, time for bed. But someone was too wound up to sleep and wanted to talk and practice rolling over! Worn out from our exciting beach day L slept for 12 full hours. Refreshed and ready to hit the sand again we headed to Butterfly Beach with Kelly. One of my favorite things is watching my friends hang out with my son. It is such a pleasure to see them spending time with him and loving on him. Kel is quite the Landon fan. After watching a cute young couple take engagement photos Landon and Miss Kelly decided to pose for a few photos themselves. All tuckered out and ready to go home. R&R. We just hanging low recuperating from all the beach fun. Just be happy the baby hickies were on your arm and not your neck! It sounds like you and Landon had quite the weekend...and he rewarded you with 12 hours of sleep! 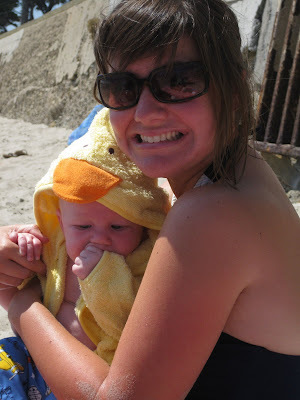 Love the pictures of Landon at the beach in his bumbo and little duck towel...too cute! I love the picture of Landon just chillin by himeself at the beach in his bumbo and duck towel. Can't wait to see you guys soon. Thanks for letting RJ have some man time with Tim. Tim was in heaven. Haha! I literally did lol. 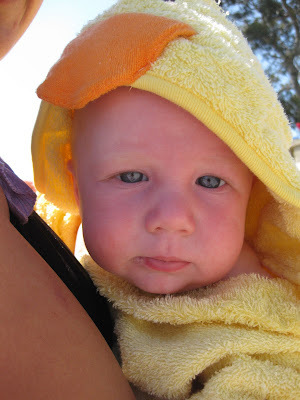 I love the pictures of he and Kelly and the one of his duck towl...so excited to see him and you next week. Landon is a lucky boy to have such a great mom. I love the pictures and the dialogue. 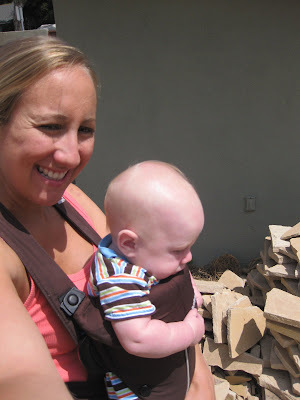 The one arm scenarios are hilarious and I am sure universally acknowledged among parents. I have a great big smile on my face and in my heart. You left out one thing however. How was the fishing?